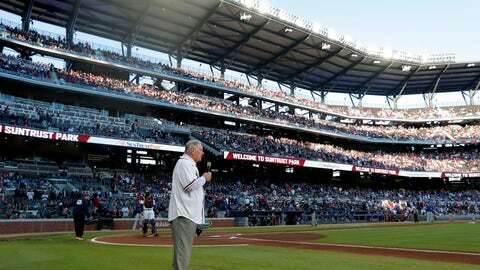 ATLANTA (AP) — Brian McCann had eagerly anticipated his first game back in Atlanta since signing with the Braves in November. It turned out to be worth the wait. McCann hit a two-run single in a four-run first inning, and the Braves took advantage of six Chicago errors to beat the Cubs 8-0 on Monday night. The 35-year-old McCann grew up near Atlanta and played his first nine seasons with the Braves before stints with the Yankees and Astros. He received a loud ovation from a sellout crowd before his first at-bat. Hendricks gave up seven runs, two earned, on 10 hits and three walks in 4 1/3 innings. The right-hander’s 2019 debut came after he agreed to a four-year extension last week that added $55.5 million to his contract through 2023. The Cubs have allowed seven or more runs in three straight losses since opening the season with a 12-4 win at Texas. The six errors were the most by the Cubs in a nine-inning game since also making six on June 14, 1982, against Philadelphia. “Hopefully that was just an anomaly game,” Cubs manager Joe Maddon said. The Cubs’ fielding woes started with Atlanta’s first batter. Rookie Mark Zagunis dropped Inciarte’s foul pop-up in left field for an error in the first inning. On the next pitch from Hendricks, Inciarte hit a homer over the 375-foot mark in right-center. A throwing error by shortstop Javier Báez on a grounder by Nick Markakis allowed Josh Donaldson, who reached on a single, to score from second as the long first inning continued. Finally, Zagunis was part of a trio of Cubs fielders who watched Ozzie Albies‘ blooper fall in shallow left field for a double later in the first. That play set up McCann’s two-run single. Sean Newcomb threw 91 pitches in four trouble-filled innings. He gave up six hits with four walks. He left the bases loaded in the third when David Bote’s grounder to third base ended the inning. Braves: RHP Mike Foltynewicz (right elbow spur), who had been projected to open the season as Atlanta’s No. 1 starter, will make a rehab start with Triple-A Gwinnett on Thursday. He could return to the Atlanta rotation in about two weeks. … LHP Darren O’Day had renewed soreness in his left forearm and won’t throw for two weeks. … RHP Kevin Gausman (right shoulder tendinitis) threw on the side and could come off the 10-day injured list to start against Miami this weekend. Manager Brian Snitker said the expected return of LHP A.J. Minter (left shoulder inflammation) “will be really big” for the bullpen. “Then we’ll start slotting guys to where they belong,” Snitker said. Minter will throw in a simulated game on Tuesday and is eligible to be activated on Thursday. He could share save chances with Arodys Vizcaíno. The dugouts emptied but no punches were thrown after Albies and the Braves appeared to protest Bote’s slide into second base on Jason Heyward’s double-play grounder to end the eighth. Umpires quickly waved players off the field, about the same time relievers were starting to leave the bullpens. No one seemed to know what the fuss was about. “I don’t even know why the dugouts emptied,” Donaldson said.